Soccer Without Borders Has Won A $250,000 Grant For Helping Kids Overcome Traumas : Goats and Soda Soccer Without Borders, which won a $250,000 grant this month, helps kids overcome past trauma by kicking it and flicking it. 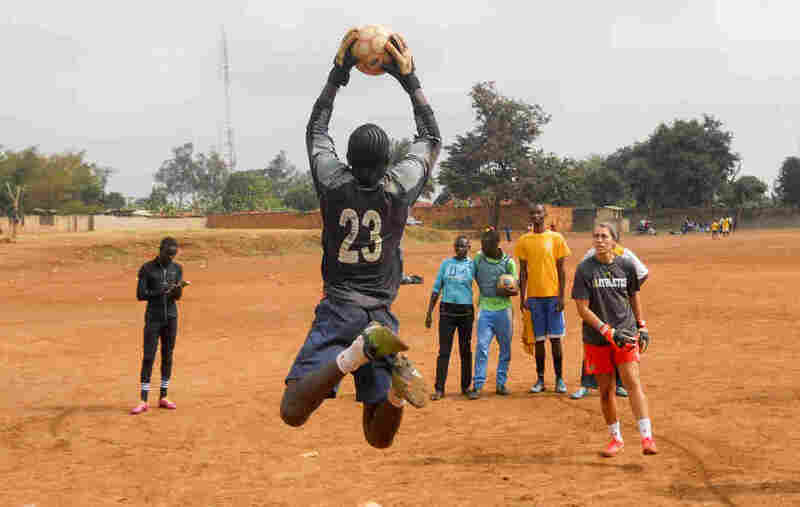 Kids in Uganda get goalkeeper training from Soccer Without Borders. 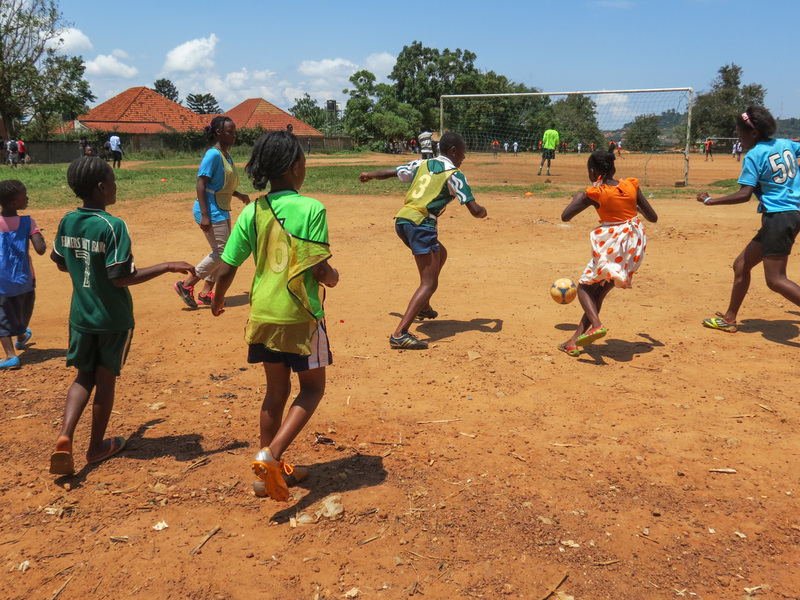 Soccer is only part of the program at Soccer Without Borders in Uganda. Its youth center offers English lessons and other classes. Soccer Without Borders uses the world's most popular game to reach underserved youth — kids who've experienced trauma, refugee kids — and help them heal and succeed in life. Based in the Boston area, the organization operates programs in four U.S. cities — Baltimore, Boston, Oakland and Greeley, Colo. — and in Kampala, Uganda, and Granada, Nicaragua, staffed by a mix of refugees. locals and Americans. This month, the nonprofit won the Barry & Marie Lipman Family Prize, which comes with a $250,000 grant and executive training and support from the Wharton School of the University of Pennsylvania. Mary McVeigh, a former professional soccer player and college coach, helped start the nonprofit in 2006 with Ben Gucciardi, who played soccer at Lehigh University in Pennsylvania when McVeigh helped coach the women's team. She spoke with NPR by phone last week from New York City, where leaders of Soccer Without Borders gathered for an annual meeting and celebration of its 10th anniversary. What does soccer teach the kids you work with? Sport is such an interesting tool. In particular, soccer. In a 90-minute game, you have the ball for three or four minutes at most. You spend the majority of your time working with others and reading others and trying to predict what's going to happen. There are many inherent lessons in that. The sport can serve as a living classroom for these kids to learn about overcoming failure, how to react to disappointment, celebrating success and respecting adversaries. You're also meeting kids where they are. That's a huge value in sports: Kids like it. They're invested in it, right into the teenage years. Can you give an example of someone who's been helped by your program? One woman, a refugee from the Karen ethnic group, a group persecuted in Burma, grew up in a refugee camp in Thailand. She came to the United States in 2010 and resettled in Oakland. She was really shy and reserved. She clearly had experienced trauma. So it was just amazing to see how month after month she came out of her shell. Soccer not only gave her a community of friendship across cultures but also brought her healing. She was elected captain of her [high school] team her senior year. She went on to Merritt College where she is captain of the soccer team, and she's the head coach for our under-14 girls team. These kids have this coach who understands what they're going through, who's been through it herself. What age kids do you work with? Our sweet spot is middle school and high school. That's an age where kids have a lot of choices. Sports can be such a powerful source of hope and building confidence, to say, "I do have a potential to be whatever I want to be." In the United States, you're working with refugees and asylum seekers? It's also the focus in our program in Uganda. The refugees there are coming from Burundi, Congo, Rwanda. You say sports is just a vehicle for developing broader skills in youth. How do you accomplish that in a developing country, such as Uganda? We have a youth center there. So that gives us a physical space. Between language barriers and financial barriers there's many kids in the refugee community that are out of school. We partner with the Xavier Project [another nonprofit] to try to get school scholarships [for the kids]. But in the meantime we provide everyday English classes first thing in the morning, followed classes in anything from nutrition to world geography. And then they play soccer. You once were in eight countries, and now three? We learned that to be effective with kids who've experienced trauma, who are in transition, you have to have consistency. It has to be the same adult in their life over time. Has to be a place that they trust, where they feel safe. Once we had that realization, you start to really see that less is more. Instead of just being everywhere all the time, we can really invest in consistent, sustainable programs. We planted a lot of seeds in the first few years and [concentrated on] those that really took root. Your work with refugees is especially timely in this unprecedented period of people fleeing across borders to escape conflict. Our main focus right now is how this displacement crisis is affecting kids. Kids have no control over it. They have no say in whether they end up in the United States or Uganda or wherever. We have to show them kindness and compassion, and soccer can help do that.